For Information on Lisa’s References please view our References page. Creating a happy family sounds like it should be an easy thing to do, but with all of today’s distractions electronically, or with work, sports, homework or extracurricular activities 24/7, that can actually be very difficult. 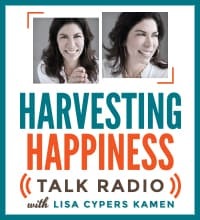 Lisa Cypers Kamen, a Happiness Expert, stopped by to help us create a happy home. Have you ever looked at yourself in the mirror, with sleep deprived eyes and baby food on you shirt and wondered what happened to yourself? You feel like you have lost yourself and with little kids, you’re not who you started out to be. Well you can get yourself back! Lisa Kamen, a happiness expert and life coach, gives us tips on how to be and stay a happy parent. Contact Carrie Hill for PR questions.